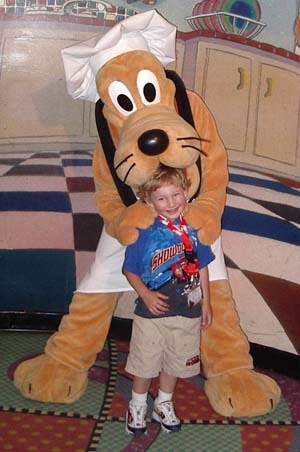 This 2006 update is being written because for the second consecutive time we were very upset with both the service and the character interaction at Goofy's Kitchen. In the past this had always been our favorite character meal and it was not unusual to attend it more than once in a trip. We were seated by the door characters go out to go on breaks. We have never found this to be an optimum spot because your child will constantly see the characters coming and going without stopping. Our waiter was Mike who quickly came and got our original drink orders. We never saw him again. Stephen, a waiter for tables near us was the one to get our drink refills. When I asked him for the buttons for the character breakfast he rudely responded that he was not our waiter, Mike was. We had been at the Disneyland Resort for 4 days and he was the first rude cast member I had run into. So the service was unusually bad for Disneyland. 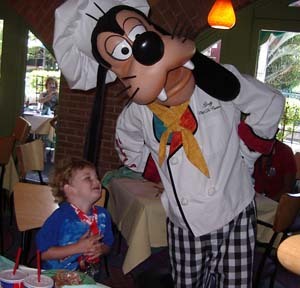 The food was up to normal Goofy's Kitchen standards. Wonderful made to order omelets as well as a selection of both breakfast and lunch dishes. Goofy's Kitchen also has a wonderful dessert buffet. The food was enjoyable. Character interaction was worse than the service. Since the characters are the only reason to pay these prices that made the meal very disappointing. 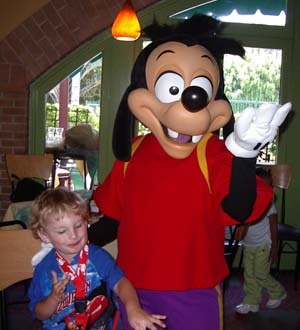 Even the much loved dancing with Goofy at Goofy's Kitchen only had Max and Goofy dancing. This was a shock, as never before have we been there when there were so few characters doing this wonderful dance. It took more than 30 minutes for the first character to appear at our table. In fact, after 45 minutes only Dale and Max had been to our table. Mad Hatter, Baloo, Chip, Belle and Goofy just walked by several times never stopping. At one point, Mad Hatter spent 10 minutes with the table next to us then walked out the door to go on break. When he came back he again passed us by. In the past Goofy's Kitchen has always been our favorite character meal because of the number of different characters that are usually there. This year, during our visit, the selection of characters was very poor. There is no doubt that where you sit in Goofy's kitchen can really affect your experience. The restaurant is so large that the characters will take several breaks before they can make a full circuit to all the tables. That means either by timing of when you sit down or because of character mistakes it is easy to be passed by. Typically when that happens during a character meal you can find the character manager and tell him/her that you have not seen a character and they typically will take care of you. This visit we did not do that because 1 - we never saw the manager and 2 - there were so few interesting characters there that it was not worth it to find him. This is our second bad experience in a row at Goofy's Kitchen. (Although last trip we had a great experience and a bad experience in the same trip) It is hard to continue recommending this character meal as a must do because the prices are high and the quality of the character interaction is hit or miss. We are currently planning a trip in November or December. For the first time in more than 10 years Goofy's Kitchen is not in our plans. Lilo and Stitch and Minnie and Friends will come 1st.